In an effort to retain length and to protect our ends from the freezing winter weather, a lot of us natural girls do protective styles. Protective Styles are those that requires little manipulation, protects the ends of the hair by keeping them tucked away. Most girls do styles such as mini twist or braids, braid extensions, weaves, buns, flat twist etc. My all time favorite is the High Top Bun. To me, its the easiest and quickest to do and almost anyone can do it (as long as you are past the TWA stage). Needed: Brush, Gel/Styler with hold, Thin Headband, Bobby pins and a Satin scarf. Brush Hair up and using a headband (wrapped twice) push it up as high as u can can (while the hair is intact). You are basically just doing high puff. Use 4 bobby pins and secure the headband (4 sides) to prevent it from slipping. Add some gel or styling product to your edges and brush around your hair leaving the top/puff out. (we want those edges to be laying flat and sleek). Grab Random medium sized pieces of hair and two strand twist loosely (say 6 or 7 or more if you like). Pin the ends of each twist either under itself or over the headband. Using your fingers fluff to make sure there are no big gaps. Remove the headband when your ready to leave and Voila! Perfect sleek up-do that did not take long. What protective style is easiest for you to do? I have seen the Ms Vaughn TV from YouTube use this brand in almost all her videos. I could be wrong but I think she owns it. My friend told me she love the line so I decide to use my Christmas Amazon gift card and give the Jelle` Styler a try. I washed my hair and added jojoba oil and then applied the Jelle` to my hair. It felt good going on. And made my hair dry in record time. However, when I wake up the luster disappeared. It was dry and dull looking. I thought I wasted my gift card money on this. I decide to retry it. I washed then applied leave-in conditioner and sealed with Jojoba oil and let my hair air dry. While its damp (no water dripping) I did small twists in my hair using the Jelle Styler and this is when I loved it. My hair clumped together and hair smoothed down so no frizz. Also it's been 3 days since my twist and my hair still soft to the touch. I just need to moisturize the ends tonight and rock a twist out or an up-do tomorrow. Overall it's a good product. It was also good at laying down my edges. Would I repurchase with my own money? Maybe not. $16.99 for 4oz is a little expensive for me. However Entwine have sales pretty often so you have to keep your eyes open. If they have sales I will repurchase. I will be doing styles and post pics with this product soon. Who knows, maybe I'll love it to the point where the cost doesn't bother me. None greasy light cream. Minimize frizz. Lock in moisture and provide hold. It made my hair dry quickly and less shrinkage than I am used to. Definitely a plus. The price. $16.99 for 4oz and about $30 for the 8oz. Its official. I am an addict and need to find an Anonymous meeting. I try to stop but it pulls me right back in. Yes I have a problem. There, I admit it. Hold up......before you think what I think your thinking... I am NOT and an alcoholic. Hahaha! 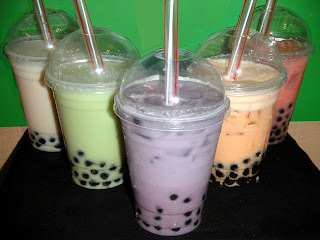 I am addicted to Bubble Tea (tapioca, pearl tea, whatever you want to call it). Yes, that I am addicted to indeed. Its funny and quite sad at the same time to be honest. So you might be wondering what the hell am I talking about and what the hell are those black things in the milk tea above. Well, my friend that is the lovely bubble tea. Those small balls are called by many names (i.e. bubble, pearl or tapioca). Bubble tea is an Asian drink that have slowly became popular in America and mostly in cities where the Asian population is large. I work in New York city so getting bubble tea is like getting candy. I often feel like its candy. LOL! Is it healthy or not? The jury is still out on that one. I have done research and found that it is mostly carboyhdrates which is not that great for you. The milk tea is sweat so calories high but these lovely bubble tea shops let you choose your sugar content. You see why I love them? Now can I justify my bubble tea addiction by saying that I only order 0% - 30% sugar. It makes me feel better. How do I know I am addicted? OK here we go. LOL! I cannot go outside for lunch or I will come back with a bubble tea. If am stressed at my job I run outside down the block and grab one and trust me, the stress decreases. Lol! If my Asian coworkers walk in here with one I instantly grab my coat and say 'be right back'. Some of them say they that I need rehab (if there is such a program). Lol. If I have loose change I put them together to go get my fix. OK you get the picture. Pathetic I know. But....before you go casting me away with my suitcase in hand to a rehab center to stay away from those pearly drinks; I must say its better than drugs. Hahaha! Isn't it? Aren't you happy its not something that can hurt me. If your a good friend, reader, follower you would. LOL! OK, that's all Folks. I had admitted my problem. Now I will sit down. Have you tried Bubble Tea? Is there something NON_DRUGS related that you can say your addicted to? 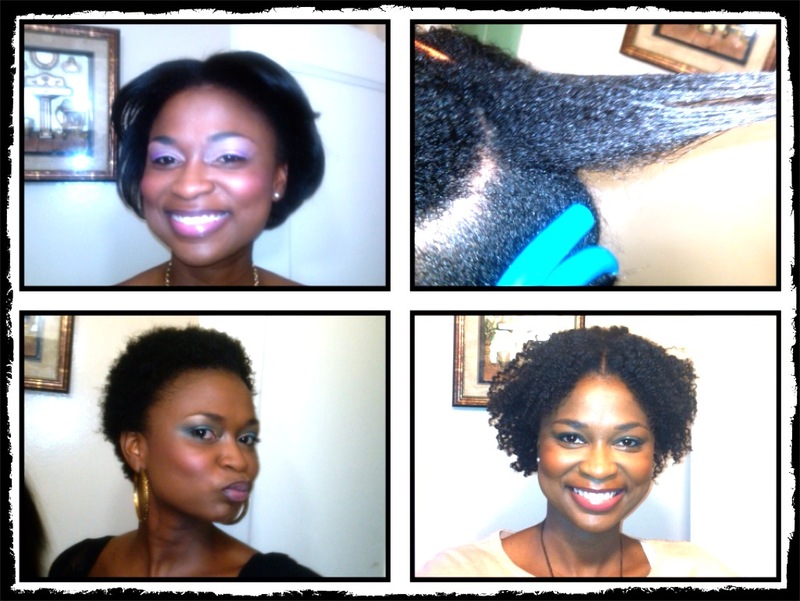 Transitioning from Relaxed to Natural Hair! 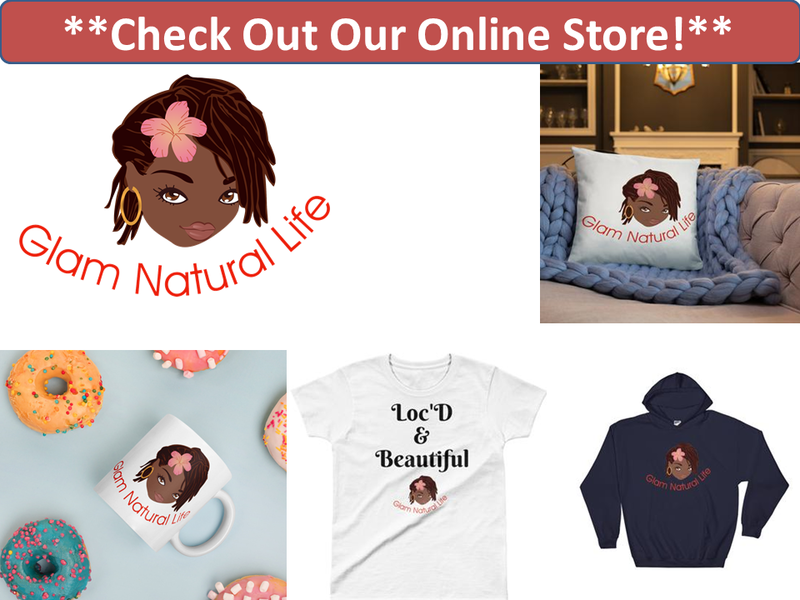 Thinking of going natural? Have you already decided but haven't done the big chop yet? Don't know where to start? Then continue reading. For some women like myself, transitioning from relaxed hair to natural hair was a very scary thought. Having a small Afro was terrifying to me. Confidence was something that I had to learn. I wish back then, I knew what I know now. Below are some tips to make the transition from relaxed hair to natural easier for you. Tips on Transitioning from Relaxed Hair to Natural Hair!! If you haven't stopped relaxing or texturizing your hair, then stop now. You need to start growing out your hair and keeping your new growth natural. Handle With Care. I cannot emphasize enough how important this step is. You have two textures working with on one strand of hair; so you can easily break the hair where the two textures meet. Every time you touch your hair please be mindful of that delicate section. Moisturize! Moisturize! Moisturize! You have to keep your hair moisturized at all times. You might need to get 2 moisturizers (a thick cream base and a light leave in). What might work for your natural hair might not work for your relaxed hair. But right now, you have both natural and permed hair. A heavy cream like Shea Moisture Smoothie will moisturize the natural part of your hair and make it feel soft and supple. However it might weigh down the relaxed ends and make it look limp and lifeless. For the permed ends you will probably be happier with a light leave in like Shea Moisture style milk or Garnier Frutis cream leave in conditioner or Giovani direct leave in - just to name a few. Always seal the moisture in by applying a light oil on your hair afterwards. Co-wash more than you shampoo. What this means is that you will wash your hair as you normally would but with conditioner instead of shampoo. You don't have to run out and spend loads of money. You can buy cheap conditioners like V05, suave and herbal essence. If you are going to be washing few times a week you want to use something cheap. Get a good sulfate free shampoo to use when its time to shampoo. If I did not co-wash during the week then I shampoo weekly. If you have been co-washing then a monthly shampoo is all that you need. Learn how to shampoo your hair properly. Shampooing too often can result in dry hair because you are removing the natural oils from your hair. Make co-washing a part of your life. You will thank me. Lol! Choose styles that will blend the new growth with the permed hair. This is the biggest frustration we natural girls faced while transitioning from relaxed hair to natural. I was scared to chop but styling my hair was dreadful. Dreadful I say. Lol! Styles best worn while your transitioning to natural hair are braid outs, Bantu knot outs or protective styles like box-braids, flat twists or corn rows. Braid outs and Bantu knot outs are great because the entire length of your hair can have a uniformed texture. Braid Outs: The key is to braid the new growth as tight as possible without pulling on your scalp too much then braid loosely when you get to the permed section. To make it more curly and flattering, put small rods/rollers on the ends. Bantu Knot Outs: The key to Bantu knot outs is to make sure they are completely dry before you take them down. Two strand twist first then wrap the hair around and under itself until the end. Wraping under so that the hair slowly look pointy versus wrapping around the hair (this way the hair looks more like a ball) - makes the definition better. Also styles that hide the relax ends like Flat twist updos. 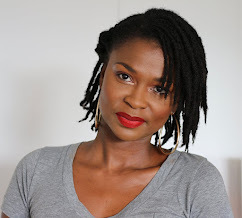 Check out this post on Flat Twists as a great transitioning style. Minimize the use of heat. My last relaxer was February 2011 and I wore weaves until July 2011. I was flat ironing the exposed hair a lot so that it could blend in with the weave. In July I went to London and the humidity reverted my hair every day so of course everyday I flat ironed the front. MY HAIR DIED. In August I decided its time stop this madness and do the chop. Due to all the heat damage I got in the front I had to cut the rest of my hair lower to keep it even. I wasted all of that time transitioning under a weave. Use heat only once in a while if at all. Don't let what happen to me happen to you. From Feb 2011 to now I should have had a lot of hair instead of having to start from scratch with a TWA in Aug 2011. Do your research. Educate yourself on products, techniques and everything natural. Don't just take someone else's word for it. Follow lots of natural hair blogs. Join natural hair forums such as http://www.curlynikkiforums.com/ or mega hair infrotmation websites such as www.blackhairinformation.com.There are lots to learn. Be involved in the natural hair community. Never expect your natural hair to look like someone else's. I remember spending loads on hair products to make my hair curly like some natural hair girls. What I failed to grasp then, was that no two natural sista is the same. No other girl's hair is better than the next. That's the beauty of being natural. We are all unique. Accept and love the natural hair springing from your scalp. What are your biggest concern or frustration while on your natural hair journey? 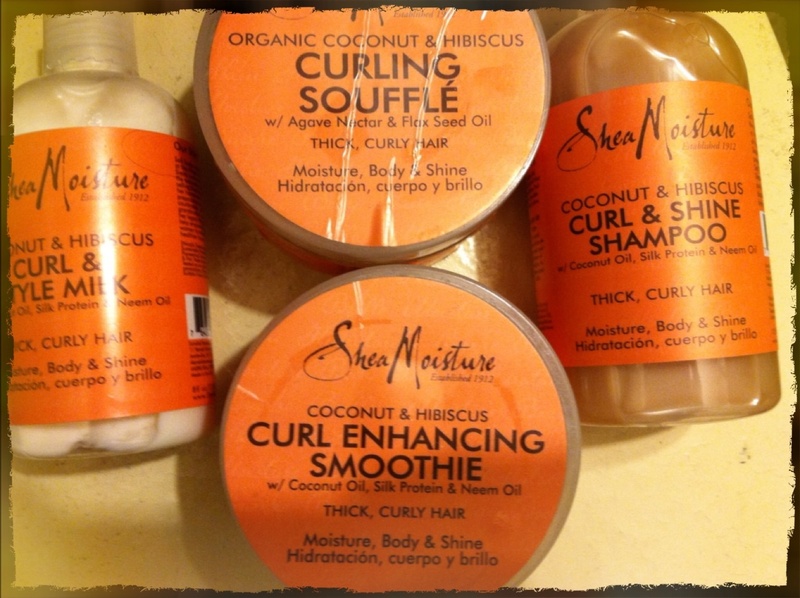 Shea Moisture Product Review: Shea Moisture Coconut and Hibiscus Shampoo, Curl & Style Milk, Smoothie and Soufflé! In the beginning of my natural hair journey I had issues with dry hair. My hair never stayed moisturized for more than a day. 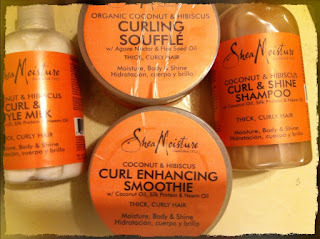 I was then advised to try Shea Moisture Curl Enhancing Smoothie and I loved it. So, I tried the entire coconut & hibiscus line and I love them. Their products are all organic and very affordable. Below is a product review of these products. Enjoy! Shea Moisture Coconut & Hibiscus Curl and Shine Shampoo gently cleans, hydrates and detangles hair for bouncy and healthy curls. Hands down the best shampoo I ever used. This is a must have for everyone (natural, permed, locs, kids, etc). It does exactly what it says it should do and more. And at $9.99 for a good all natural shampoo; that's great. STAPLE! Will always repurchase. It really cleans. It is affordable. A bottle last forever because you only need a small amount. Do not strip the hair and it suds. It leaves my hair feeling really soft. You cant live without. Shea Moisture Coconut & Hibiscus Curl & Style Milk has coconut oil, silk protein and Neem oil that adds moisture, body and shine to your curls. Keeps curly hair frizz-free, shiny and healthy. The best little leave in around town. Lol! This is my first bottle but I think it will be a staple. It's light and my hair soaks it up so well. Makes my hair feels really soft and shiny. It is very light so my hair is not weighed down. Very moisturizing. Leaves hair shiny without feeling greasy. It is affordable. Nutrient rich vegetable butters condition hair, restoring moisture, body and shine. Enhances curls, minimizes frizz and provides curl control. This has been my go to moisturizer since I big chopped Aug 2011. It moisturizes my hair and offer shine without being greasy. I apply it to damp or dry hair and my hair loves it. I normally moisturize using the LOC method. I have experimented with lots of products but I always come back to this. It's the one product I stock up on. I never miss a Target sale. Lol! If you need a great moisturizer then look no further. Moisturizes and seals very well. Hair is soft for days and very little if any frizz. It defines and promotes curls with a soft smooth after-feel. The soufflé is a custardy gel like product. Not sure I can quite explain the consistency but its a good product for hold and shine. It leaves my twist and braid outs very defined without the crunchy flaky effect you will get from a gel. This product goes a longggggg way and that is no joke. If you are heavy handed then you are going to hate it. Using a lot can result in a greasy volcano on your head because it has coconut and flax seed oil in it. I mix a small amount with the smoothie and my result is soft shiny defined hair style. Provide hold and shine for twist outs and braid outs. Can be greasy if you use a lot of product while styling. In addition to these products I also tried the Cowash and loved it. Click Here to See that review. Have you tried Shea Moisture products before? Leave comments below. Loving IslandEssence's Marley Braid Faux Bun tutorial on Natural Hair! I saw this tutorial my girl IslandEssence from YouTube posted showing how to do a perfect faux bun using marley braid. I love it! Gonna get me a pack next week and try. I just hope I can rock it for more than one day. lol! Have you ever tried Marley braid before? Hey loves! Happy New Year!! I am doing a New Years giveaway for you guys. Since I started my blog I have been inspired to keep posting informative material and communicate with you guys and love every second of it. I love the support I have received. I first want to say thank you for reading, following and interacting with Glam Natural Life. Greatly appreciated. I have put together a nice collection of samples and also one full size product to give away to one lucky winner. I have included items from my favorite brands that I use all the time. Hair products, skin care products and beauty products. Lots of goodies I love and know you will love too. Below is an image of the contents. 2. What is your current basic hair regimen? * I will randomly select a winner and post it on the site. Good Luck and have a Happy and Prosperous New Year!! !